And why Bill Gates is so interested in the tech. The first step in understanding solar fuels -- fuels generated directly from sunlight -- is to forget what you know about how energy is generated and installed, according to Caltech Chemistry Professor Nathan Lewis, who’s been leading research on the subject at the university for a decade and working on the science for some 40 years. “It’s not going to look like anything that's been developed or deployed in any functional form" yet, he said. While the process most closely resembles artificial photosynthesis, Lewis' solar fuel device won't resemble a leaf. Instead, picture a rain jacket with multiple layers that take in water, carbon dioxide and sunlight and wick out a usable product, like a gas or a fuel, he said. Or an artificial tarp, rolled out on the ground of a football field, which would absorb those natural resources and emit a fuel that could be collected by drain pipes. Early forms of such a device could make hydrogen fuel, and later forms could produce a biofuel that could be used in traditional cars. Sure, the concept is pretty far out there. It’s the stuff of energy nerds. But it’s also the stuff that gets people like Bill Gates excited. You might have heard of Lewis in recent months, because his lab has captivated the attention of the Microsoft co-founder, who’s on the hunt for these types of futuristic energy breakthroughs from the depths of laboratories across America. Last October, Gates visited Lewis’ lab, an event which the professor described as “inspiring” for his students. Gates has also mentioned solar fuels as something he’s particularly interested in in blog posts and during interviews. So what’s the big draw? Here’s the vision: solar is the Earth’s largest source of clean energy, and being able to capture and store it for use as fuel would be the most efficient way to make use of it. This would be far more energy-dense than, say, lithium-ion batteries. For comparison's sake, 60 tons of batteries would be needed to store the energy of 1 ton of gasoline, according to the Lewis Research Group. At the same time, currently existing biofuels, such as the ethanol produced from vast fields of corn, are a very inefficient use of energy and land. But low-cost, low-carbon liquid fuels would be a very helpful way to aid the process of weaning the world off of carbon-emitting gasoline. Scientists have been working on trying to directly create biofuels, and hydrogen fuel, from sunlight for decades. But the chief obstacle has been that the parts used in such a device, such as semiconductors and catalysts, historically have been made from rare and expensive materials like platinum. The hard part has been finding readily available, affordable materials with which to construct a device that can make fuels that are less expensive than the current methods of oxidizing water and producing hydrogen, or steam reforming methane to produce hydrogen. Lewis is getting closer than many others have to tackling the components of the process that he thinks are needed to create an efficient, low-cost solar fuel device. In an interview this week, Lewis said that out of five crucial pieces needed for such a device -- two light absorbers, a membrane and two catalysts -- his lab now has four of the pieces in hand. 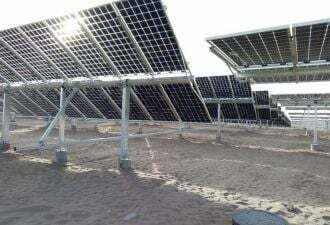 They just need the second light absorber, or semiconductor, to be able to obtain enough energy from sunlight to split water, which is the first step of the process. The other four pieces have already been developed and tweaked, including a membrane initially created in the fuel-cell industry and a catalyst used for water oxidation. The micro form of the device, which would be about the size of a human thumbnail, said Lewis, would consist of wire-shaped semiconductors covered in catalyst particles, and embedded within a separator. Replicate that wee device over and over again, put the pieces together, and you wind up with the rain jacket or the tarp. Or it could look more like a sheet of bubble wrap, with each active device fitting into a bubble filled with water. Lewis’s team has reactor designs and prototypes that can produce hydrogen at a rate of 10 percent efficiency. When asked how long he thinks it would take the get the fifth part right, Lewis said, “It could take two days or two years. Or we could not do it. It could be ‘unobtainium,’” he joked. “We like to say we have 50-50 odds of success, but if we don’t try, the odds of failure are guaranteed,” he said. Even if Lewis can figure out all of the pieces and ultimately demonstrate a solar fuel device that’s efficient and low-cost in the lab, that’s just the very beginning of the process of devising such a technology. The modern solar cell was invented over 60 years ago and only in recent years did it emerge as a low-cost way to produce electricity and become more widespread (and it still only accounts for less than 1 percent of U.S. electricity generation). Lewis isn’t the only one who’s dedicating time and resources on trying to crack the code of solar fuels. 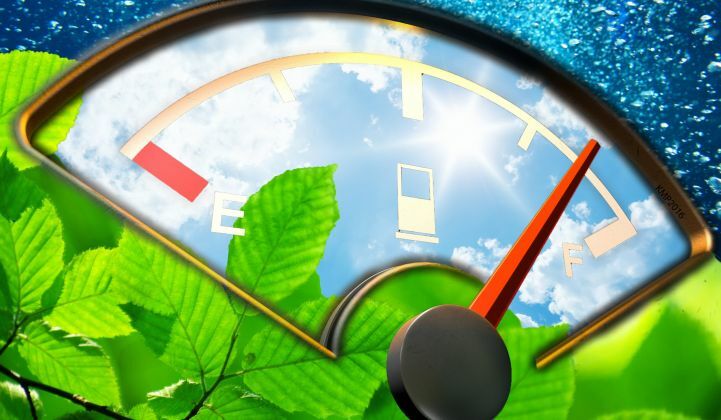 Many others, like Daniel Nocera, a professor at Harvard University, and Devens Gust, a professor at Arizona State University’s Center for Bio-Inspired Solar Fuel Production, have been working on this technology as well. The Department of Energy’s ARPA-E program, which funds high-risk, early-stage research, has convened workshops on the topic. Some scientists are tweaking biology, instead of just chemistry, to find the right combo. But with a new president in the White House who has yet to make clean energy a priority, all of that could be in jeopardy. “It’s definitely a time of uncertainty,” said Lewis, though he added that the outcome could be positive, negative or even neutral -- the ultimate result is still unknown. Federal government support could prove to be crucial to a technology like solar fuels. Venture capital funding for such early-stage innovations has evaporated. Bill Gates' Breakthrough Energy Ventures has pledged to support this type of tech, but that's just one firm, and it's taken Gates et al. many years to cross the $1 billion threshold.